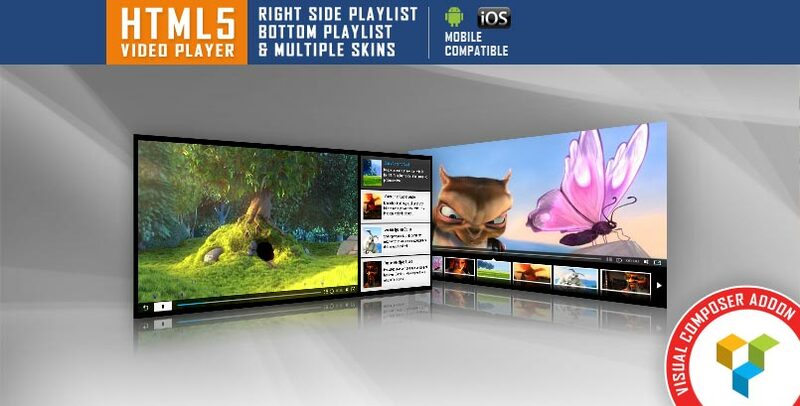 HTML5 Playlist Video Player with Multiple Skins supports full screen, having all the controllers usable in full screen mode, including playlist. With HTML5 Video Player VC Addon you have the option to select one of the 5 custom made skins which will enrich the design of your page. The video player if fully responsive. Parameter to enable or disable responsive behavior. The video player comes in two versions: Right Side playlist and Bottom Playlist. You can choose from 5 skins for each player. To choose the skin just set “skin” parameter. You can insert the player multiple times in the same page with the same skin or using a different skin. It supports full screen, having all the controllers usable in full screen mode, including playlist. You can set a Title and Description for the video. Supports HTML & CSS formated text. You can also click on the video to play/pause the video.